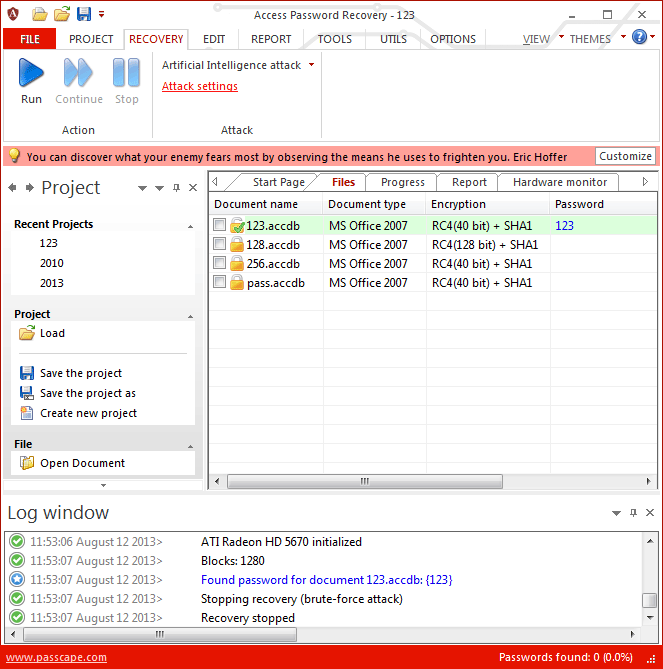 Loading password-protected Access databases into the project. Editing the document list: deleting, adding, selecting protected documents, etc. Password recovery. Includes selecting, configuring and launching the selected attack or several ones. Menu Bar at the top of the program's window. Information Bar - for displaying brief information texts - like tips, warnings, etc. Task Bar at the left side duplicates the main menu bar, providing quick access to the most common operations. Main Window consists of several parts. The first tab is the welcome window. The second tab contains the list of documents to be analyzed and recovered. Then there goes a tab with the current attack state (progress) indicator, a tab with the statistics/reports. And finally - a hardware monitor tab. Log Window at the bottom displays information on the current state of the application, current operation, etc. The program's log can be copied to the clipboard or saved to a file (right-clicking opens the context menu). Status Bar is aimed for informational purposes.